Don't judge a book by its cover. 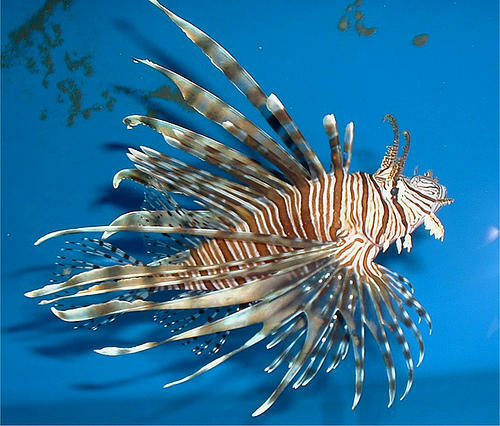 The beautiful colors of the lionfish hide an extremely toxic poison. Problem: Lionfish are non-native, invasive predators in Atlantic coral reefs. They consume more than 50 marine species, including economically viable ones like grouper, yellowtail snapper and spiny lobster. Although lionfish meat is considered safe to eat, capturing and handling the fish pose a danger due to their venomous spines. If stung, humans can suffer extreme pain, excessive sweating, respiratory distress and even paralysis. Solution: Lionfish's tender, white flesh is an easy stand-in for grouper or snapper in ceviche preparations. At a recent charity dinner, Julie Frans, chef at Essensia Restaurant inside The Palms Hotel in Miami Beach, cured the fish in citrus juices then served it in a watermelon gazpacho. "Her lionfish is excellent — sweet and tender, almost like lobster," guest Bobbi Namath said. "Almost." Lionfish also works well when deep-fried. The trick is to find a supplier or diver who will sell lionfish with the spines already removed, making the fish easier and safer to work with. Frans got hers in a frozen block, spineless. "I'm a mother," she said. "I have to go home in one piece, not poisoned by a fish puncture." Chef Julie Frans of Essensia in Miami Beach with her lionfish watermelon gazpacho. 1 .Toss lionfish in citrus juices and salt. Cover and refrigerate for about two hours. 2. Liquify watermelon in blender. Reserve watermelon juice in a measuring cup. 3. Mix tomatoes, peppers, onion, cucumber, chipotles, oil, vinegar and black pepper in blender, in batches if necessary. Blend everything very well. 4. Incorporate watermelon juice with the other ingredients. Season to taste. 5. Pour gazpacho in bowls. Add lionfish. Top with avocado, watermelon, pepitas and basil. Is there any animal more closely associated with the Everglades than the American alligator? OK, the Burmese python has been the 'glades press "darling" as of late, but invasive, non-natives do not count for the purposes of celebrating the Everglades. While Florida's iconic reptilian king deserves all of the attention it gets, there are plenty of other cool critters that inhabit the Everglades. Animal welfare advocates are at odds with wildlife conservationalists as the Florida Senate prepares this week to look at a controversial feral cat bill.